USDTL was the first laboratory to commercially introduce meconium testing to the market in 1991 and has remained a pioneer in research and development in the newborn toxicology industry. Among pregnant women aged 15 to 44 who reported alcohol use: 10.8 percent reported current alcohol use, 3.7 percent reported binge drinking, and 1.0 percent reported heavy drinking with 10.1 percent of pregnant women reporting binge drinking during the first trimester. * Early identification of exposed newborns provides for early treatment and better results for the baby. Meconium contains the amniotic fluid swallowed by the fetus in the last half of pregnancy and is released as the first stools after birth. Meconium is easier to collect than neonatal urine and provides a much longer window of exposure of up to 20 weeks. A sample of 3 grams (1 teaspoon) of meconium is needed for maximum sensitivity. USDTL will analyze smaller amounts, but with a reduction in sensitivity and/or the window of exposure. We recommend weighing the specimen on a jeweler's scale. Meconium specimens can only be submitted through hospital or health system accounts. Click here to download the meconium collection instruction slides. Click here to download the meconium drug panels. Click here to view the Meconium Resources page. For information about umbilical cord tissue drug testing, please click here. Place name and I.D. number, or newborn ID sticker, on the Custody and Control Form and collection container. Enter date of birth and time of birth. Document each separate collection with a collector signature and date/time of collection on the Custody and Control form. 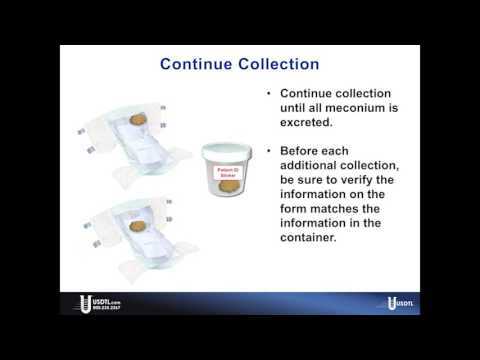 Be sure to continue collecting specimen into the same collection container until all meconium has been excreted. Verify that the container ID# and the ID# on the form match before each collection. When collection is completed, close and latch the lid. Place the bar-coded, tamper-evident seal (from the bottom of the Custody and Control form) over the top of the lid, opposite the latch and hinge (Fig. 1). The collection container should be sealed so that opening the lid would break the seal, indicating tampering. Do NOT place the seal over the container latch or hinge. Failure to properly place a tamper-evident seal over the lid will result in a rejected specimen. Initial and date the seal. Mark the meconium box on the form and (5a) select all test(s) that have been ordered. Complete and sign the form. Place the top copy of the completed Custody and Control form in the large pouch of the plastic specimen bag provided. Place the meconium container in the small pouch of the specimen bag, and seal the bag. Place the specimen bag in the box, then place the box in a courier overwrap. Contact your courier for pick-up.